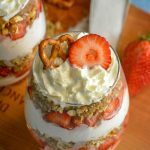 A stunning dessert, these parfaits put a creamy new spin on the classic strawberry pretzel salad. Add the strawberries to a bowl. Sprinkle the sugar over top, stirring to coat. Refrigerate the strawberries for 30 minutes. Don't skip this step, the sugar helps them release their natural sugar and juices. Pulse the pretzels in a food processor, just until broken into small pieces- but NOT pulverized. We want some crunch and that means some chunks. Add the melted butter and cinnamon, pulsing another time or two- just until evenly combined. In the bowl of a stand mixer, whip the cream just until stiff peaks have formed. Don't over mix, or you'll end up with butter instead. Using a whisk, stir in the brown sugar and extracts until evenly combined. In your cups, add a layer of the cream mixture, strawberries, then pretzels. Repeat. Top each cup off with a bit of whipped cream, and a slice of strawberry and a pretzel. Serve immediately. The strawberries and the cream mixture can both be prepared several hours ahead of time, then sealed, and refrigerated until ready to use. Do not prepare the parfaits and then refrigerate or it will get soggy.